Synopsis: When a group of trespassing seniors swim in a pool containing alien cocoons, they find themselves energized with youthful vigour. Quotables: WALTER: Face-eating, Jack? I’ve never heard of that. Is that some kind of delicacy? Cocoon is cute and funny, but it’s also heartwarming and sentimental. Accepting of their own mortality, a group of elderly folk in a retirement community gain new life after a dip into a pool where several strange cocoons rest at the bottom. I find myself thinking about death almost everyday. What’s going to happen after I die? When will it come for me? Who will I leave behind? Who will leave me behind? What lies beyond that shadowy veil? All of these uncertainties and more make me fearful of death. And though I know it is absurd to fear the inevitable, there is no answer that has ever assuaged that fear inside of me. 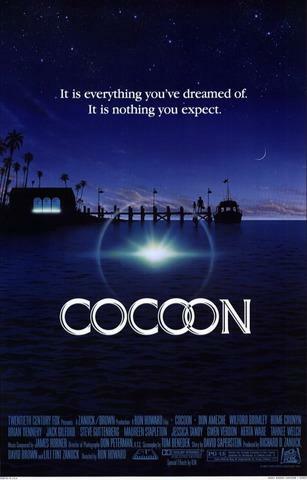 So I find myself comforted by movies like Cocoon, that make death seem less terrifying.